Emirates has announced plans to reduce service to the USA amid fallout from the Trump administration’s new immigration restrictions and its ban on electronic items in airline cabins from the Middle East. The number of weekly flights from Dubai to the USA will be reduced from 126 to 101. The Dubai, United Arab Emirates-based airline says it will cut down on the number of flights to five of the 12 cities it serves in the US. Starting May 1, flights to Fort Lauderdale, Florida, will be reduced from daily flights to five flights a week. The airline says it will make the same cuts to its Orlando, Florida, service starting May 23. Starting June 1 and 2, Seattle and Boston service will be reduced to a single daily flight from two previously. Finally, beginning July 1, Emirates’ twice-daily service to Los Angeles will be cut down to a single flight. LAX is a bit confusing as EK217/218 had already been announced as a temporary cancellation from 1 May to 1 July 2017. Now the cancellation is indefinite. This makes any new USA destinations very unlikely in the foreseeable future. There had been rumours of Phoenix, Las Vegas, Detroit, and others that were less likely! This also means that there are airframes that can be used for other opportunities. Or they stay grounded. 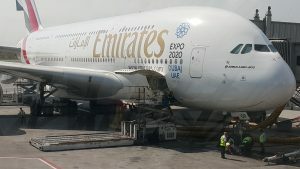 China would be the obvious growth but while Dubai welcomes a number of Chinese carriers Emirates itself appears to be heavily restricted from growing in China. It will be interesting to see how Qatar and Etihad respond – although Etihad in particular has only a limited exposure to the USA.